Remember it is essential that you test your success so far against your creative intentions. See this previous post if you have ‘forgotten’ what your creative intentions are. You developed an understanding of German Expressionism and it’s impact on the horror genre. Especially in relation to the monster. We developed an idea from a given circumstance, ‘What if.’ As well as using other stimulus materials, like moodboards and music / sound. We used the screenplay format to write the opening sequence of a horror film. Worked with the cinematographer on story-boarding the sequence this should have taken into consideration framing and narrative importance. You have worked with your actors to explain, explore and develop the characters. You have worked with the cinematographer on blocking. You (will) have overseen the cinematography and worked with your actors to film the sequence. You have worked with the director to develop ideas on lighting, framing and composition in the storyboard. You created a shot list of 30-50 shots, which prioritise the shoot and ensured you are filming to edit. You have setup lighting and camera for each take in collaboration with actors & the director. All of this work is excellent evidence for your reflective journal. Please unsure that you keep your journal up to date with all your pre-production documents and reflections. Also please remember to reflect on the shoot and if possible take photo evidence of you in action during the shoot (you could give this role to a (minor) role). Please see updated blog league for specific posts and evidence to be uploaded. As we know the screenplay is a visual script and the really successful ones are those that allow an image to be painted for the reader – so that they can SEE what the screenwriter is intending. This week we are going to spend time developing the idea and redrafting the script. By the end of the week you should have agreed a final draft to use on shoot. Here is the script to the opening sequence of Alien (1978) Scott. Notice how economical it is. Almost a bullet point list of what we can hear and what we can see. In production teams read through the scripts your group has written and discuss the merits and ideas for development for each. You must then choose one script which will become the groups idea. Considering what will happen step by step and what the audience will SEE and how the scene will unfold. Complete an extended step outline for each of your scenes. Here is an example from a previous student. You should be aiming for at least 20/25 images and you can present these as below or in a one page collage. Based on your shared work this week redraft the script. Review the video essay of at least two peers and refresh your memory about the nature and ‘rules’ of German Expressionism. Your task is to develop a visual / cinematic idea for your opening sequence and write the screenplay for it. We will be working in groups next week and deciding which screenplays will go forward into production, for now this is a solo exercise. Here is the first page of a good example from a student screenplay. Include descriptions of the locations in your screenplay (The Mirus Battery and/or surrounding rural area(s)). Include element of the setting / important props within the scene. Create an atmosphere which belongs in the horror genre. Use descriptive language (simile’s and metaphors). Give a sense of how the camera might move or the edit cut. Give a sense of the diegetic sounds in your sequence. In pairs share your documents. Write the first draft of a screenplay based on one the ideas you have been attracted to in this lesson. You should aim for about 2 -3 pages of script. Any longer and it may well be longer that 2 -3 minutes of film time. This is the brief for your first full film sequence. Your creative intentions should be clearly identified at the outset and your reflections throughout and once complete will be based on them. You must also reflect on your developing understanding of your production roles. The creative intentions may be drawn from this list and you should identify 3-5. You may choose others or modify these as you wish. Create a sense of…mystery, suspense, horror, intrigue…around a given place. Introduce a monstrous character or presence. Introduce a…tense, frightened, oblivious… victim. Build the sequence to a shocking/scary crescendo. Use specific cinematography techniques from German Expressionist film making. Use montage editing to develop a sense of place and/or compress time. Use continuity editing to make sense of a characters (inter)actions. Define each of these role in terms of the tasks they will be required to undertake during that particular stage of production. Here is our brainstorm of the tasks each production role entails. Action lines (in the script) give the scene a sense of atmosphere. They also give actors and directors guidance about their characters and the tone of the scene. The last line is the point of the scene. Funnel the scene down to its final point of crisis or tension. Subplot characters echo and foreshadow the narrative journey of the central protagonist. Write a short screenplay for a scene entitled ‘Stolen’. Your screenplay should be formatted using this preformated document. …should be no more than 1 page. …should have a clear climax. The final line should define the scene. It should contain a major and supporting (subplot) character. It should be achievable to film in 8-12 shots (some of which can (and should be) repeated)). The 5 act structure and the self contained structure of each act. To create a sense of place and/or events without giving any narrative information away. This is often done in title sequences to capture the mood of the film without giving away spoilers. Here is short film, which is an extended montage of a place. The montage should last 30-40 seconds. It should contain at least 12 different (beautifully composed shots) some of which may be repeated in the edit. The montage should communicate a clear meaning (what’s going on) and clear atmosphere (tone or feel). There should be a clear sense of time passing and have a clear beginning and end, which fades out to black (to make it seem like more time has passed). Here is a storyboard template that is similar layout to the professional one above. Here is a document which explains how to design a storyboard. You storyboard should be scanned / photographed and uploaded to your Reflective Journal under the screenwriting section. You should also reflect on it’s usefulness as a pre-production planning / visualisation tool. You will be acting for another pair of students and so will spend one lesson acting and the other filming and directing. You get a variety of shot types. Working with the cinematographer to block the scenes. Be clear with the emotion that you want you actors to be expressing. Make sure that you work through the storyboard efficiently and in time. Be an encouraging and positive presence on the shoot. Completing a spotting session with the editor and making a list of sound effects that you want. Films have a big advantage in how they can tell stories. They are not bound by the rules of normal time! 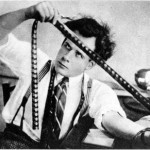 Editing can reorder screen time, which is different from reel time (the duration of the film), and this reshaping of the narrative can add to the audience’s pleasure of the film. How? Here is a short film, which plays with narrative and uses am interesting narrative structure. First off, it is important to note that we are not talking about characterisation or representation! We are talking the role the characters have in the narrative. In other words what is their job in the story? This analysis can give us helpful clues to understand the themes and ideas, especially when we consider the ways in which the characters (ideology) conflict. Characters’ narrative function in Harry Potter. Consider these character roles for the stories you studied in the last lesson. Please remember that a character in a story may fulfill more than one role. Using the film you studies yesterday develop your poster with details of the characters’ and their narrative function. The big events that push the story forward, causing the characters to act / react. When and how important story information is revealed. The characters & their narrative function. The themes/messages that the director wants to communicate. 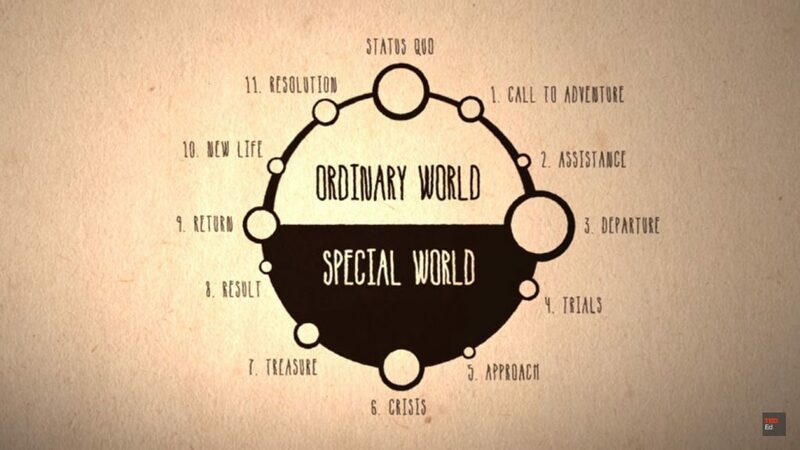 Here is a cool video about the narrative structure of films which are about the adventures of a heroic figure in a typical Hollywood adventure film. Here is an info-graphic from this video from Ted Ed. Remember the story mountain? Apply this in reverse to the story that you have chosen and explain the basic structure of that narrative. 3. The journey or quest. Consider the last two slides in the show above. In your story, who changes, how & why? What do they realise and how does this epiphany reveal the theme of the story? Add this to your poster in either stage 4 or 5. Most films follow one character (the central protagonist). Typically this central character has to undergo trials and overcome problems as the story progresses. Often these events and conflicts change the character and they learn something essential about themselves or a great truth about the world. You will be allocated one short scene from the film and you should complete an analysis of how she is represented. Please look particularly at the mise-en-scene and comment on how C.L.A.M.P.S communicates messages and ideas about the character and her experiences. Here is a document to help you complete the analysis. You will be leading a discussion with the rest of the class on the section that you have been given in the next lesson. Use the video to take screen-grabs of interesting elements of mise-en-scene and copy those into the slide. You can then record a voice over using Screencastify to analyse features of the text.